Hielscher ultrasonic devices are in use worldwide as laboratory mixers, high shear mixing equipment, full-size in-line homogenizers or particle mills. The applications include mixing, dispersing, particle size reduction, extraction and chemical reactions. We supply to various industry segments, such as nano-materials, paints & pigments, food & beverage, cosmetics, chemicals and fuels. Read more about our devices and applications, or contact us now for the right ultrasonic systems for your process. 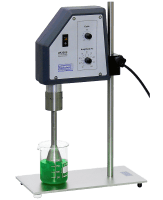 Hielscher offers a wide range of ultrasonic lab homogenizers (50 to 400W) to homogenize samples in beakers, test tubes or vials. Flow cells and flask adapters allow for more complex setups in the laboratory. For the sonication of closed vials, we offer the VialTweeter. Bench-top homogenizers (0.5 to 2.0kW) are used for application research, scale-up work, pilot studies, process optimization or smaller batch processing. These programmable ultrasonic devices can be combined with flow cell reactors and pumps for in-line processing. For high volume in-line processing or batch processing, we offer high-power ultrasonic probes (4 to 16kW). In commercial installations, these can run in clusters to process several hundred tons per hour. Sanitary designs, and multi-feed flow cells are avaible to adapt to your processing needs. While the scale-up of a process from the laboratory or bench-top level to full production is the most critical and hardest step for other mixing technologies, it is most simple with Hielscher ultrasonic equipment. This is because; during scale up we do not change any of the driving parameters, such as amplitude or pressure. 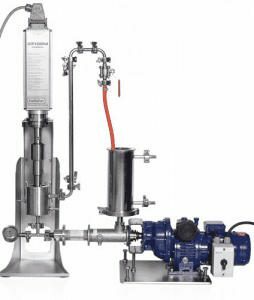 Ultrasonic batch mixing works well for volumes of up to 100L for some purposes, however ultrasonic in-line mixing using flow cell reactors and a feed pump is the more effective solution. In a flow cell the ultrasonic power is highly concentrated on a small volume resulting a more uniform processing and better product quality. A back pressure valve can be used to increase the pressure in the flow cell. This intensifies the sonication significantly resulting in higher hydraulic shear. Our new devices come equipped with enhanced digital controls, such as touch screen, SD-card protocoling, temperature control and LAN interface for browser control. No software installation needed. 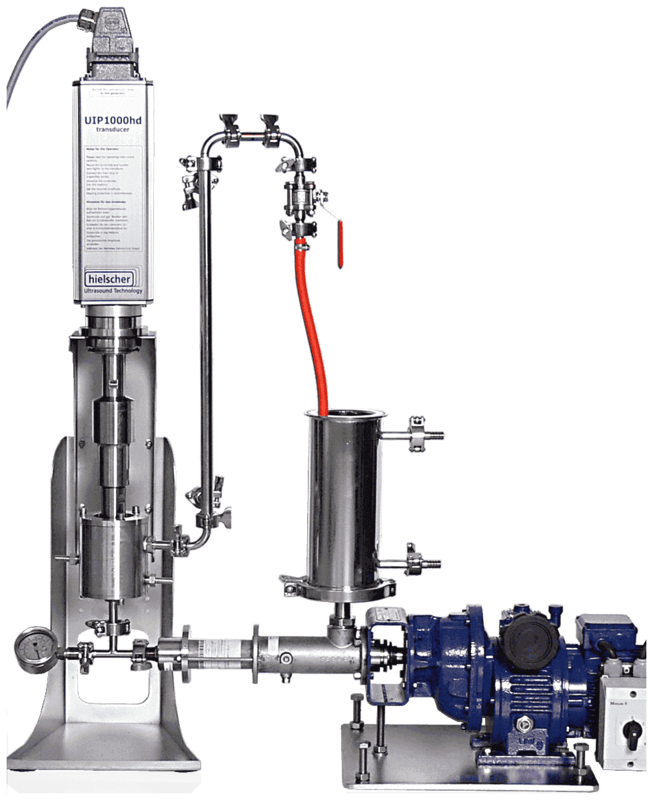 Our bench-top and industrial homogenizers can process viscous slurries of up to 250,000 centipoise. For viscosities higher than 2,000 cPs we recommend the use of flow-cells with progressive cavity pumps for better coupling. Hielscher ultrasonic mixers are available with sanitary fittings for easy access and cleaning. The ultrasonic cavitation assists clean-in-place procedures (CIP) – it is an extremely powerful ultrasonic cleaner in place. While tank agitators may blend easily miscible liquids of similar viscosities, liquids of different viscosity or more viscous liquids may require high mechanical shear for fast and complete blending. Our ultrasonic devices can easily blend two or more liquids in-line. For this, the liquids would be combined just before the ultrasonic flow cell reactors. Read more about blending! Hielscher ultrasonic homogenizers are very effective in achieving a small and uniform globule or particle size when processing powder/liquid or liquid/liquid formulations. The high hydraulic shear forces generated by ultrasonics break agglomerates, droplets and cell tissue into smaller fragments and produce a uniform fine-size product. Our range of homogenizers covers any processing volume from lab vials to bulk production size. Read more about homogenizing! Hielscher ultrasonic homogenizers break powder agglomerates in liquids that conventional agitators and high shear mixers cannot break. The high cavitational shear disperses and homogenizes agglomerated particles resulting in a higher specific surface area. Hielscher ultrasonic homogenizers can easily be integrated in-line or in a batch. Read more about deagglomerating! For almost every product, it is important that particles are separated from other particles in order to enlarge the particle surface area and to achieve an uniform distribution. Even dispersions can easily be achieved by ultrasonication. 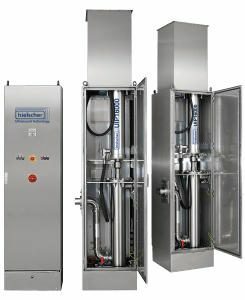 Hielscher’s ultrasonicators are widely used for the production of fine-size dispersions in the micron- and nano-range. Read more about dispersing! When mixing immiscible liquids into an emulsion, droplet size and distribution are a key factor for the stability of the emulsion. Ultrasonics can create very fine size droplets and narrow size distributions. In most cases, our ultrasonic mixers can achieve submicron droplets when preparing emulsions in a batch or in-line. Different from high pressure homogenizers, the high shear produced by our ultrasonic devices will emulsify even high viscosity liquids, such as heavy fuel oils (HFOs). Some formulations may require emulsifiers or stabilizers to be added. 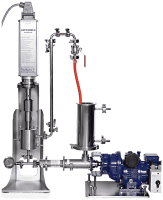 In this case ultrasonicators help to mix the emulsifier uniformly. Read more about emulsifying! Ultrasonic homogenizers are an efficient and reliable means for the solubilizing of various materials, such as salt, sugars, syrups, resins and polymers. The high-speed liquid jets created by the ultrasonic cavitation increase mass transfer at boundary layers. This results in faster and more complete dissolving and leaching of particles or high viscosity liquids. Read more about ultrasonic dissolving! Hielscher ultrasonic processors can break agglomerates, aggregates and primary particles of various materials, such as pigments, metal oxides, or crystals. Ultrasonics can achieve very uniform and narrow particle size distributions with little to no variation between batches. Ultrasonic milling is most efficient in the range below 500 micron to sub-micron and nano-size range. Our ultrasonic reactors can handle high solids loads and high slurry viscosities. The final particle size will depend on the hardness of the product. Read more about particle size reduction! The surface of powder particles is a key factor for the interaction with the surrounding liquid. It is at such solid/liquid phase boundaries, where dissolving, chemical reactions or catalytical activity take place. Ultrasonic homogenization increases the exposure of particle surface to the liquid phase by uniform deagglomeration and particle size reduction. During catalytic and chemical reactions, the particle surface can be blocked by residue deposition, boundary layer formation, oxide layers and fouling. Ultrasonic cavitation causes high-speed liquid jets, high hydraulic shear and inter-particle collisions resulting in particle surface cleaning. 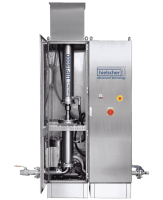 Hielscher ultrasonic devices can be used in a batch or in-line to remove contaminations from particles in liquids. Stirring is an often-underestimated process and requires reliable equipment, especially for increasing viscosities and volumes. Conventional agitators such as paddle mixers or rotor-stator mixers are limited by various factors, including viscosity and scalability. Therefore, high power ultrasonicators are the right choice for your mixing process due to their advantages in higher through-put, time saving, lower operational costs, safe operation (no moving parts) and simple maintenance. When mixing dry powders, such as, pigments, thickeners or gums with liquids, the powder particles tend to form agglomerates, lumps or so-called “fish-eyes” (partially hydrated powder with a dry powder core). Agitators and stirrers will wash the surface of such agglomerates, only. This results in long mixing times and poor product quality. Ultrasonic mixing breaks agglomerates and lumps leading to an agglomerate-free solution. Furthermore, sono-chemical effects are well known to activate the particle surface area, which leads to advantages such as faster reactions and enhanced product quality. For measurements by analytical instruments (e.g. HPLC, atomic spectrometer, etc. ), generally most samples have to be liquefied. If the sample is soluble, the solute (such as sucralose, salts, e.g. in powder or tablet form) can be dissolved in a solvent (e.g. water, aqueous solvents, organic solvents etc.) resulting in a homogeneous mixture, composed of only one phase. The dissolving process can be carried out by manual or mechanical stirring, which is time-consuming and inefficient. Related problems are sample losses due to manipulation or lacking reproducibility by random errors and uneven mixing. To initiate a chemical reaction, energy is required. The so-called activation energy is the amount of energy required to initiate a reaction and carry on spontaneously. By the input of ultrasonic energy, chemicals reaction can be initiated as attractive forces are overcome and free radicals are created. Typical chemical reactions that benefit from ultrasound are sono-catalysis (e.g. phase transfer catalysis), synthetic organic reactions, sonolysis as well as sol-gel-routes. Furthermore, ultrasonic forces create highly reactive surfaces, which is an important technique to increase catalyst activity. The phenomenon of decreasing viscosity under increasing shear forces is termed shear thinning or thixotropic. The decrease of viscosity is of significant importance when the particle load of a medium should be modified. To achieve a higher solid load, in the first step viscosity must be lowered. After viscosity reduction, solids can be added and dispersed in the medium. High-shear forces created by ultrasonic cavitation cause shear-thinning and outstanding dispersing results. This application is mainly integrated before spray-drying or spray-freezing to increase the capacity of the spraying process or to influence the rheology of thixotropic material, e.g. polymers. Milling and particle size reduction are key processes in many industrial branches such as for paint & coatings, inkjet ink & printing, chemicals or cosmetics. The ultrasonic milling technology is proven for its reliable size reduction and dispersion in the micron- and nano-size range. Its unbeatable strength over bead, ball, and pebble mills lays in the avoidance of any milling media (e.g. beads/ pearls) that contaminate the final product due to abrasion. In contrary, ultrasonic milling is based on inter-particular collision – this means the particles to be milled are used as grist. Therefore the time-consuming cleaning of milling media is not any longer an issue. High viscosities and large volume streams can be processed resulting in a high quality product. For the integration into an industrial process line, Hielscher supplies the suitable solution: clusterizable systems, easy integration/ retrofitting, low maintenance, simple operation and high reliability. Read more about wet milling and fine grinding! Cell disintegration or lysis is a common part of daily sample preparation in biotech laboratories. The goal of lysis is to disrupt parts of the cell wall or the complete cell to release biological molecules. The so-called lysate can consist in e.g. plasmid, receptor assays, proteins, DNA, RNA etc. Subsequent steps after lysis are fractionation, organelle isolation or/and protein extraction and purification. The extracted material (= lysate) has to be separated and is subject to further investigations or applications, e.g. for proteomic research. Ultrasonic homogenizers are a common tool for successful cell lysis and extraction. As the ultrasonic intensity can be leveled by adjusting the process parameters, the optimal sonication intensity – varying from very soft to highly intensive – can be set for each substance and medium. Read more about extraction and cell lysis! Microbial inactivation is a key process in food processing. Due to the increasing demand for fresh, mild processed food, the industry follows the customers’ demand by replacing thermal preservation by milder processing methods. Ultrasonication is a non-thermal technique that allows for the inactivation of microorganisms at sublethal temperatures resulting in a better preservation of the sensory attributes, nutritional and functional properties of the product. As microorganisms are the main cause for food spoilage, the preservation technique must be targeted towards them. The advantage of sonication is the full control over sonication intensity and thus the adaptability to specific types of microbes and the product. Read more about microbial inactivation! In many liquid products, dissolved gas such as air, oxygen or carbon dioxide, causes problems for down-stream processes or product quality. Dissolved gas can result in corrosion, foaming, the formation of micro-bubbles or microbial growth. Under ultrasonic irradiation, the dissolved gas is extracted into the vacuum of cavitation bubbles (vacuum degasification). The gas filled bubbles subsequently float to the top and can thereby be removed. The gas content of a liquid can be decreased rapidly below natural equilibrium at atmospheric pressure using ultrasonic degassing. Read more about degassing! Suspended micro-bubbles in liquids and slurries are a significant quality issue for many products, as such bubbles can result in product impurity, microbial growth, haze in coatings, mechanical instability, or uneven printing results by gas-containing inkjet ink. Ultrasonic waves propagating through the liquid force suspended bubbles to merge into bigger bubbles that will float to the top and can thereby be removed. Ultrasonication helps bubbles to move through the liquid, e.g. water, oil or resin, leading to a faster and more complete deaeration. Read more about the removal of micro bubbles! In many industrial processes, such as fermentation, digestion or chemical processes, foam causes great problems as it makes process less controllable. Mostly, foam is an unwanted by-product, which must be removed. Commonly used anti-foaming chemicals are expensive and contaminate the final product. In contrast, highly intense ultrasound waves (sono-defoaming) break the foam without contamination. The destruction of foam is a soft, low energy ultrasonic application. Specially designed plate sonotrodes create high amplitude air born waves, which destabilize the bubbles in the foam so they collapse. This can be achieved in a few seconds and does not have any residual effects. Read more about defoaming! Although heating is mostly not the main purpose of sonication, the side effect of heat generation in the treated medium should not be neglected. Controlled heating is advantageous as many processes are improved by heat. During many processes, e.g. preservation or chemical reactions, the ultrasonic treatment is purposely supported by elevated temperature, known as thermo-sonication. For heat-sensitive materials, targeted cooling during the sonication secures stable temperatures during ultrasonic processing. 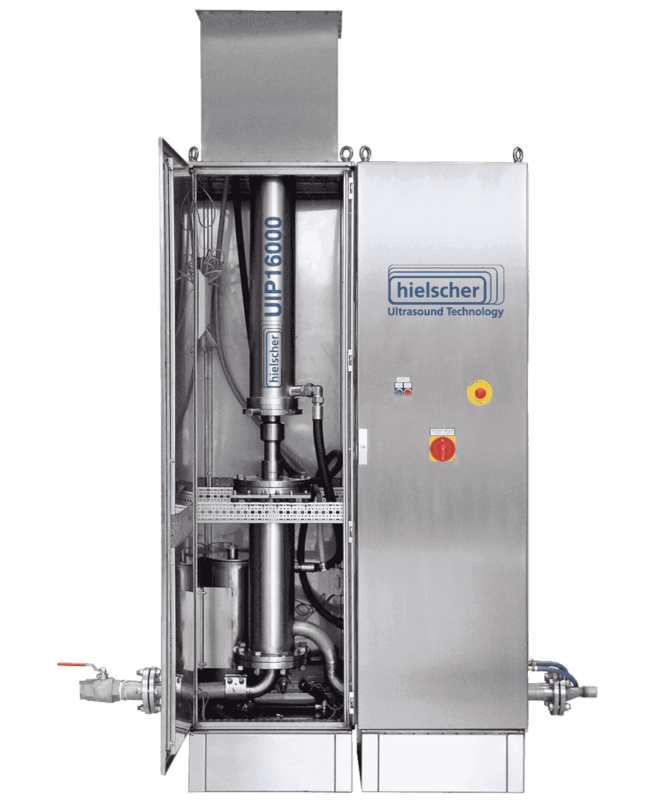 By implementing ice baths, flow cells with cooling jackets and integrated heat exchangers in the setup, Hielscher offers the solution for your individual targets. High power ultrasound contributes to mechanical as well as microbial stabilization. Ultrasonically generated high shear forces provide an extremely fine mixing so that inter-particle bondings are overcome and mechanical stabilization is achieved. The durability of the stability depends on the formulation: some emulsions and dispersions are self-stable due to the very fine and even homogenization, whilst other mixtures must be supported by the addition of stabilizing agents. If stabilizers are needed, ultrasound is a very reliable tool to mix the stabilizer into the mixture. For biological and food-related products, ultrasound is dependable technique of microbial inactivation to achieve product stability and preservation. Ultrasonic microbial stabilization is a non-thermal preservation alternative that convinces by efficient microbial deactivation and only mild heat generation. Ultrasound has been demonstrated to be very effective on the destruction of food-borne pathogens, like E.coli, Salmonellae, Ascaris, Giargia, Cryptosporidium cysts, and Poliovirus. The structure of a particle’s surface is important for the particle characteristics. The specific Surface area of a particle becomes larger in correlation with the reduction of the particle size. Thus, by decreasing particle size, the surface properties become increasingly prominent – especially during nanonization. For the usage of such materials, surface characteristics are as important as the properties of the particle core. This means that the functionalization of nanomaterials enables a broad range of applications such as polymers, nanofluids, biocomposites, nanomedicines, and electronics. This makes the size reduction, deagglomeration, and functionalization an essential step in particle treatment. Hielscher ultrasonicators are widely used for the treatment of micron- and nano-particles in order to mill, deagglomerate, disperse and modify their structure. By the modification of the particle surface, an unwanted aggregation of particles can be avoided. In downstream steps, the ultrasonically modified particles can be mixed into composites, where sonication achieves a homogeneous distribution within a matrix. This is very important for manifold industrial applications regarding long-time stability or mechanical properties of hybrid materials. Cavitation erosion resistance is an important aspect of material durability and lifetime. To ensure material functionality, erosion propensity and material fatigue must be tested for quality assurance. Erosion resistance is of high relevance for materials used in demanding environments such as ship propellers, (marine) coatings, pumps, engine components, hydraulic turbines, hydraulic dynamometers, valves, bearings, diesel engine cylinder liners, hydrofoils, and in internal flow passages with obstructions etc. To perform cavitation erosion testing in accordance with ASTM Standard G32-92, controllable and reproducible ultrasonication is inevitable. 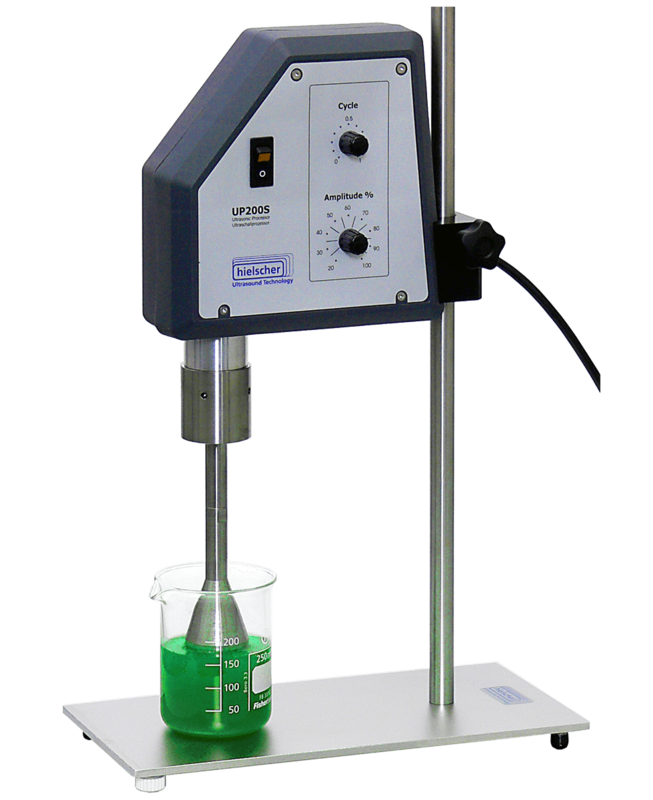 Hielscher ultrasonic devices can be used for the direct and indirect erosion testing of samples. The same ultrasonic equipment can be used for both, the direct and the indirect tests. During direct testing a specimen is mounted to the sonotrode, whilst for indirect erosion testing the specimen is fixed in the beaker. The erosion tests can be carried out under fully controlled environmental conditions and in almost every fluid. By adjusting the ultrasonic intensity, the erosive power can be adapted to the test requirements. Read more about erosion testing! Endless materials such as wires, cables, tapes, rods, and tubes have to be cleaned of lubricant residues before they can be further processed downstream, such as galvanizing, extrusion or welding. Cleaning of endless materials is often the bottleneck of the production line. Hielscher Ultrasonics offers an unique ultrasonic cleaning process for efficient inline cleaning, which can handle even high throughput speed. The effect of the cavitation generated by the ultrasonic power removes lubrication residues like oil or grease, soaps, stearates or dust. In addition, the pollution particles are dispersed into the cleaning liquid. By that, a new adhesion to the material to be cleaned is avoided and the particles are flushed away. Advantages of ultrasonic cleaning at a glance: proven & reliable, efficient, environmental-friendly, less or none chemical cleaning agents, plug-and-play, modular systems, simple operation, low maintenance, 24/7 operation, small footprint, retrofittable, customizable. Read more about continuous strand cleaning! Separation of particles by size difference requires agitation of the screen or mesh. Ultrasonic agitation for sieving and screening is a proven tool, which increases sieving capacity and saves time as powders are enabled to pass the sieve faster and more complete. The result is a better final product quality with less material loss due to incomplete separation – and all within a shorter processing time. Read more about sieving and screening! The control of bacteria and algae growth in water is for many industries a highly relevant upstream- or downstream-process for production. Powerful ultrasound waves are known for their effects on cell structures causing cell lysis and cell death as well as for their cleaning capability due to mechanical impact. Furthermore, tanks, barrels, vessels and even filters can be successful cleaned from biofilms, residues, and debris in a very simple but efficient sonication step. Ultrasonically generated mechanical vibrations and cavitational shear forces remove the contamination. In general, cleaning agents are not necessary and the removed residues can be easily flushed away. Nano materials attracted the attention of scientists, researchers and engineers of almost any branches as nano-sized particles show unique characteristics. Their physical properties such as optical and magnetic properties, specific heats, melting points, and surface reactivity offer high potentials for material with extraordinary strengths. But the smaller the particles, the more difficult becomes their treatment. High power ultrasonics is often the only method to effect nano particles effectively. The influence of power ultrasound allows for manifold applications in materials chemistry & development, catalysis, electronics, energy, as well as biology & medicine. Mostly, high power ultrasonicators are the only efficient tool to achieve the desired milling and dispersing results of nano particles (e.g. nanotubes, graphene, nanodiamonds, ceramics, metal oxides etc.). Alternatively, the ultrasonically assisted precipitation or so-called bottom-up synthesis is an efficient way to create pure nano crystals with unique properties. Especially, metallic nano particles, alloys and organometallic composites attract particular interest, as metals are of great importance in the industrial sector. Here too, sonication offers unique results such as the tin-coating of aluminum and titanium particles. The precipitation or bottom-up synthesis describes the controlled formation of atoms, molecules and ions into larger chemical compounds. Precipitation is also useful for the purification of products. The advantage of precipitation is that by this method smallest particles of almost uniform form, particle/ crystal size and morphology are obtained. For the production of nano particles of high purity, precipitation and self-organization of molecular components is often the only way to achieve the desired quality. As precipitation is a very fast reaction, the efficient mixing of the reactants is essential. Ultrasonic mixing is the key for an even and fine mixed solution. Hielscher Ultrasonics supplies highly reliable ultrasonic equipment that guarantees complete control over the process parameters and a full reproducibility. Read more about precipitation! Ultrasonic applications in chemistry branch out in every section including material synthesis, analytics & determination, biochemistry, organic & inorganic chemistry, neurochemistry, nuclear chemistry as well as electrochemistry. Whether high power ultrasound promotes reactions by its outstanding mixing capabilities (e.g. emulsion chemistry, phase transfer catalysis PTC), activates surfaces (e.g. catalysis, sol-gel), initiates by contribution of the required kinetic energy or the overcome of chemical forces (e.g. Zeta potential, Van-der-Waals forces, ring-opening reactions), unique results can be achieved. Catalysts increase the conversion rate of chemical reactions and are needed to initiate a reaction or to keep the reaction running until a complete conversion is achieved. The fact that catalytic reactions are often slow and incomplete can be changed by high power ultrasound. Ultrasonication contributes to both, the homogeneous and heterogeneous catalysis and achieves faster conversion rates and higher yields. Ultrasonic forces create highly reactive surfaces and thereby increase the catalytic activity. Even though catalysts are not consumed themselves, surface depositions can lower the catalyst’s activity over the time. As solid catalysts often require rare and expensive metals, a long lifetime is an economically essential aspect. Ultrasound is a proven technique to remove fouling from the catalyst surface for reactivation to full catalytic capacity. Read more about sono-catalysis! Chemical reactions are often slow and incomplete, thus the achievement of fuller utilization of the precursors is desirable. High-power ultrasonics cause physical effects in liquids, for instance enhanced mass transfer, emulsification, bulk thermal heating, and a variety of effects on solids (milling, deagglomeration, surface activation, modification). These physical effects significantly influence chemical reactions. In consequence, ultrasound contributes to manifold chemical reaction such as catalysis, synthesis & precipitation, sol-gel routes, emulsion chemistry and polymer chemistry. 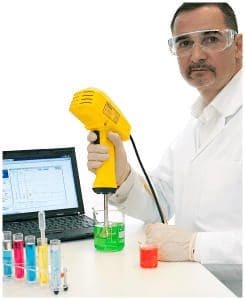 Hielscher ultrasonic devices are ideal for sonochemical application as Hielscher systems are capable to handle solvents, acids, bases and explosive materials (ATEX rated ultrasonicator UIP1000hd-Exd). All systems can be used for batch sonication as well as for inline sonication. A broad assortment of devices and accessories allows for matching the process requirements. Read more about sono-chemistry! Ultrafine nano-sized particles and spherical shaped particles, thin film coatings, fibers, porous and dense materials, as well extremely porous aerogels and xerogels are highly potential additives for the development and production of high performance materials. Advanced materials, including e.g. ceramics, highly porous, ultra light aerogels and organic-inorganic hybrids can be synthesized from colloidal suspensions or polymers in a liquid via the sol-gel method. The material shows unique characteristics, since the generated sol particles range in the nanometer size. Via the ultrasonic sol-gel route, gels (so-called sono-gels) with smallest particle size, highest surface area and highest pore-volumes can be created. The broad range of Hielscher’s ultrasonic equipment offers the ideal device configuration for specific materials and volumes. Read more about sol-gel processes! Chemical waste imparting its recovery and degradation are a severe problem of industrial processes such as mining, chemicals manufacturing and landfill sites. Waste and pollutants (e.g. in soil, waste water…) have to be processed in terms to recycling, waste reduction or deposition. Sonochemical degradation is a highly potential process, which is characterized besides its outstanding and unique results by environmental friendliness and easy operation. Sonication can result in the cleavage of bondings, chain length reduction, molecular modification or activation. Thereby, it contributes to oxidation, sorption, sonolysis and leaching. Characteristic features of ultrasonically-assisted degradation are an increase of the chemical conversion rate as well as ultrasonic cavitation and the sonochemical effects provide a better mixing, initiation of reactions by energy input, creation of functional group (e.g. cleavage –OH hydroxyl groups) and radicals (e.g. H2O -> H+ and HO-). Sonication has various effects on polymers: the effects of physical nature include mixing (such as emulsification, dispersing, deagglomeration, encapsulation) and bulk heating, whilst chemical effects create free radicals and change molecular structures. Ultrasound contributes in several ways to polymerization: High power ultrasound waves produce and disperse nano-size particles, emulsify non-miscible liquid phases and create free radicals which contribute to emulsion polymerization. Polymer nanocomposites and hydrogels can produced successfully by ultrasound. Furthermore, the surface functionalization of polymers plays an important role to enhance the performance of basic polymers and offers new approaches toward the development of tailored materials. The improvement of surface properties of commodity polymers is of high economical interest. Thereby, sonochemistry is the right way for successful polymer treatment. When reagents react at a catalyst particle surface, the products of the chemical reaction accumulate at the contact surface. This together with fouling and passivating layers blocks other reagent molecules from interacting at this catalyst surface. By ultrasonic cavitation and the thereby caused inter-particle collision, the residues on the particle surface are broken-off and washed away by ultrasonic streaming in the liquid. Cavitational erosion on particle surfaces generates unpassivated, highly reactive surfaces. Short-lived high temperatures and pressures contribute to molecular decomposition and increase the reactivity of many chemical species. Hielscher ultrasonic reactors can be used in the preparation, reclamation and regeneration of catalysts. Sonoluminiscence describes the phenomenon of short bursts of light emission generated by imploding ultrasonic cavitation bubbles in a liquid medium. Although there are different theories that try to unveil the phenomenon of sonoluminiscence, until today scientists could not prove their theories, which include hotspot, bremsstrahlung radiation, collision-induced radiation and corona discharges, nonclassical light, proton tunneling, electrodynamic jets and fractoluminescent jets, quantum explanation (which is related to the Unruh or Casimir effect) or thermonuclear fusion reaction. The ultrasonic effects on biological and microbiological systems are manifold: Dispersing & Homogenization, dissolution of aggregates, cell and tissue lysis (e.g. bacteria, yeast, viruses, algae…) & extraction of intracellular materials (e.g. proteins, organelles, ribosomes, DNA, RNA, lipids, peptides…), plant cell transformation, chromatin isolation and shearing, chromatin immunoprecipitation and related applications are successfully performed by sonication. 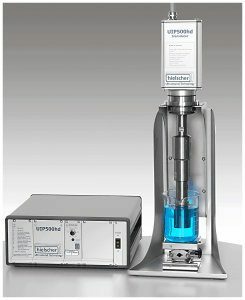 Hielscher Ultrasonics has the perfectly suitable ultrasonicator for each individual application. For smallest vials and test tubes, the VialTweeter is the device of your choice, whilst a lab probe device such as the UP200Ht or UP400S best treats larger samples. For bench-top and commercial applications, ultrasound systems from 500 watts up to 16,000 watts handle large volume streams easily. Various sonotrodes, flow cells and accessories complete the program and cover all requirements. Deoyxribonucleic acid (DNA), ribonucleic acid (RNA) and chromatin are – along with proteins – the major macromolecules for all forms of life. DNA and RNA are the molecules that encode the genetic instructions of organisms. Chromatin is the combination of DNA and proteins where from the content of the cell nucleus is built. For research purpose, it is necessary to fragment these molecular building blocks into smaller components to investigate and analyze them or to rearrange them during immunoprecipitation and crosslinking. For DNA, RNA and chromatin shearing, the fragment size is very important. By full control over all important parameters, ultrasound enables for targeted molecule fragmentation. For instance, the ideal chromatin fragment length ranges between 200 and 1000 bp. Ultrasonic shearing is achieved by bursts in pulse mode. Due to intelligent devices and accessories, processing needs such as direct or indirect sonification, sample cooling, digital process recording are provided by Hielscher’s ultrasonic equipment. This ensures successful microbiological processing and operation comfort. In the paint, coating and ink industries, particles are the essential raw material for product formulations. For high quality products that offer the expected characteristics, even and reliable particle processing is crucial. The particle size is the key factor that influences the properties of the final product. High power ultrasound is the effective means for micron- and nano-size milling and deagglomeration – without the hassles that occur by using milling media or nozzles. For inks and ink jet inks, the particle size is the key quality mark: are the pigments too small, the ink loses its tinting strength – are the pigments too large, the printer nozzles clog resulting in poor printouts. Ultrasonication allows adjusting the processing parameters exactly to the aspirated milling and deagglomeration results. When the ideal ultrasonic processing parameters are once found, there is no reason to change them. The continuous inline production enables for an even output of highest product quality. The particle distribution within the formulation is vital for the expression of products’ attributes. Only if particle are dispersed evenly and uniform, the final product shows satisfactory quality such as transparency, UV resistance, or scratch resistance of coatings. Dispersing is one of the proven power applications of ultrasound. For the production of cosmetics, mixing of ingredients is an essential step. High power ultrasonics achieves reliable results in fine-size homogenizing, dispersing and emulsification – e.g. for creams and lotions, nail varnish, and make-up products. Besides the blending applications, ultrasound is well known for extraction and cell modifications (e.g. liposomes), too. As many ingredients, which go into a formulation, are gained by extraction, for instance lipids, proteins, aromatic compounds or colorants from cells, ultrasound is a high potential tool for new formulations. The applications of ultrasound in the pharmaceutical industry are manifold: synthesis of chemical compounds, extraction of active compounds (e.g. phenols, flavonoids from plants), emulsification (of lotions, creams and ointments), liposome preparation (encapsulation), or inactivation of viruses and pathogens for vaccines. In the production of pharmaceuticals, the use of Hielscher ultrasonicators allows for increased production capacities by improved yields. Due to reliable industrial ultrasonic devices reactions can be run on larger scale – as batch process or as continuous process in a flow cell reactor. The energy sector offers manifold applications for successful and efficient use of ultrasonics. The most popular and well-know application is maybe the ultrasonically assisted biodiesel production (transesterification from virgin or used/ waste vegetable oil (UVO; WVO)/ animal fat to biodiesel), which results in higher yield and quality, less methanol use and a significantly accelerated conversion. When the biodiesel feedstock contains more than 2-3% of free fatty acids (FFAs), acid esterification is a useful upstream step to avoid the formation of high soap. Besides the transesterification and esterification processes, high power ultrasound supports the extraction of oils from crops (e.g. rapeseed, soy, canola, corn, palm, peanut, coconut, jatropha etc. ), or algae. Bioethanol is a green fuel which is obtained when the starch and sugar of corn, crops, potatoes, cane, rice etc, is fermented by yeast cells into ethanol. By the application of power ultrasonics, the plant cells are disrupted and the intracellular material is extracted so that the feedstock is better available for the enzymatic digestion. Thereby, starch and sugars are better available for fermentation resulting in a faster and more complete conversion and higher yield. 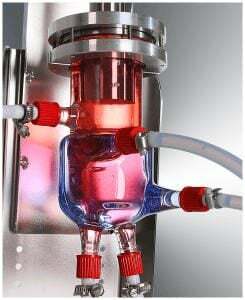 The ultrasonic homogenizing technique is very effective for the production of stable and unstable emulsions, which allows the successful creation of the aquafuels. Therefore, fuels mostly heavier fuels like ship diesel is emulsified with water. The use of water-infused fuel results in a more efficient combustion and a significant reduction of NOx emission. Another important field is the ultrasonic treatment of coal. Mild food processing is more and more important due to customers’ increasing demand for fresh, largely natural food. Thus, for common processing steps such as blending & homogenization, extraction, stabilization & preservation, the traditional methods are incrementally replaced by innovative processing techniques such as ultrasonication, which is a non-thermal method for food. The benefits of sonication are based on its mild, fast and clean processing, resulting in less product loss and improved food quality by conserving freshness and vitamins. Hielscher’s ultrasonic processors are used for manifold applications in the food industry such as preservation & microbial inactivation, homogenization, stabilization & preservation of juices, purees and smoothies, extraction of flavors and fructose (sugar), shear thinning for viscosity reduction, maturation of wine and balsamic vinegar, alcohol refining & flavoring, cloud emulsions, ice cream (promoting ice nucleation and mass transfer), algae extraction for nutraceuticals, conching of chocolate to break sugar crystals, liquefaction of honey, refining of edible oils … Read more about ultrasonics for food and beverage!